I've been using a lighter hand when it comes to bronzer, making sure that my makeup look concentrates on the cheek highlighter and lip colour. I find that glossy skins starts with a nourishing base and the Glossier Priming Moisturiser is the perfect example of this. Used before your foundation of choice, this helps to calm, plump and prep the skin. When I first used the 3ina Highlighter* I didn't think that I'd like it; the texture was dry and I didn't think it would work well with dehydrated skin. This on top of the NYX Sunbeam Illuminator helps to create a luminous finish that is still super natural on the skin, making it one of my favourite dreamy teams at the moment. 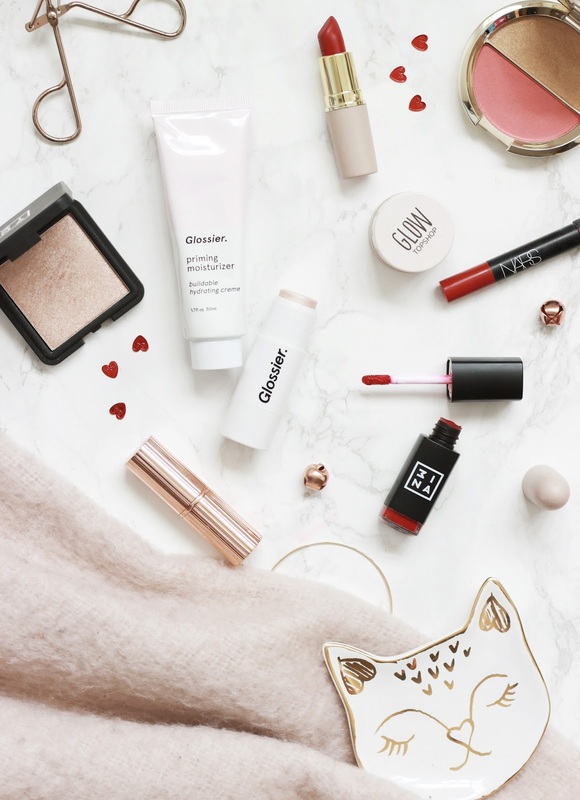 Cream highlighters are my favourite way to add a glossy sheen to the cheeks with ease and nothing has worked better for a super natural glow than the Glossier Quartz Haloscope. I particularly like to apply this after I've warmed it up with my fingers, then dab onto the face until I build up the glow I'm after. There's something about red lipsticks that reminds me of Autumn and Christmas, meaning I don't often reach for them as much as I should for the rest of the year. I'm not sure if it's because I'm looking forward to the colder seasons ahead, but I've been loving red lipstick once again, particularly my beloved Mellow Madness Lipstick shade. It's bright, bold and long lasting on the lips - Everything you need in a matte red lip. A new addition is the 3ina 500 Long Lasting Liquid Lipstick*, which is pretty much everything is says on the tin. It's matte, easy to use and doesn't budge even after eating. I'm really impressed with this at the moment as it doesn't dry down instantly as soon as you apply it ,meaning you can really get a good shape with the applicator. I couldn't not give a quick mention to the Nars Cruella Lip Pencil; a long serving favourite of mine and one which I reach for whenever I need a fool proof red lip that can be easily reapplied throughout the day. I will definitely bring this one away with me on holiday, as it's great for an evening going out look. Do you like the glossy skin and red lip look?